Bring the game to your game room, garage or collection with an officially licensed beveled wood dart cabinet. Enjoy competition among friends while pre-gaming, during halftime, or at the after party . The officially licensed beveled wood dart cabinet comes with everything you need for a great game. It includes a high quality, self healing sisal fiber dartboard, six steel tipped darts, dry-erase scoreboard, out chart, marker and mounting supplies. 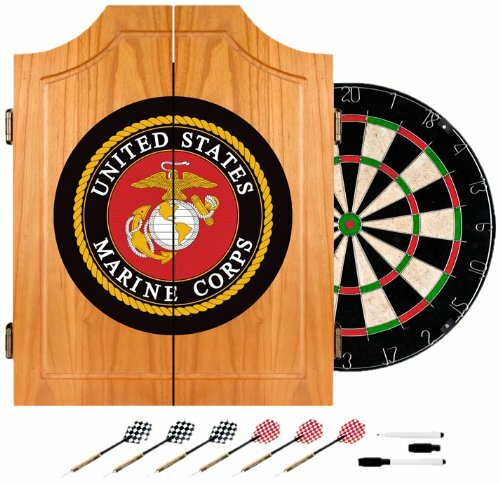 With an officially licensed beveled wood dart cabinet you’re guaranteed to have fun no matter what the score!